M74 is the prototype of "Grand Design" spiral galaxies - galaxies that have distinctly defined spiral arms. 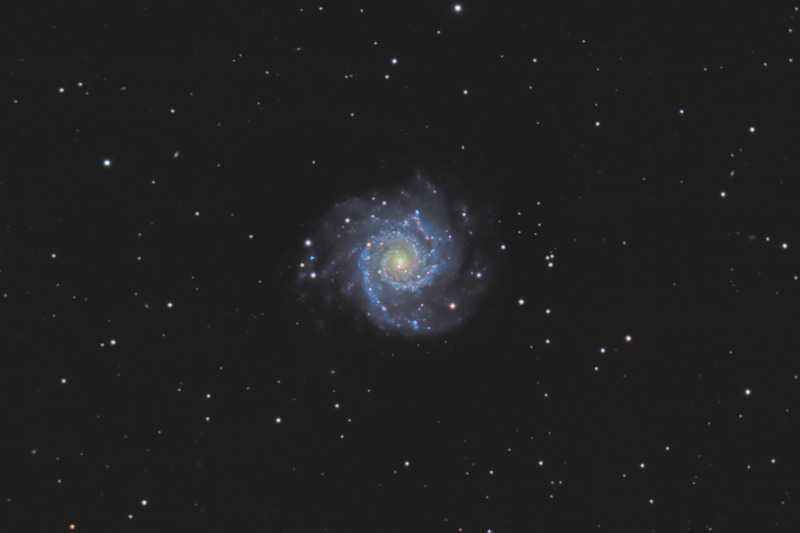 Telescopically, M74 is relatively large - at 10' in diameter, its about 1/3 the apparent diameter of the Moon. Because of its fairly large size, it ends up being the second lowest surface brightness of all the objects in Messier's catalogue. As such, it is a challenging object for astrophotography. Be sure to click on the image to see the full version, as there are over a dozen small background galaxies peppered throughout the photo. In this image, North is Up. This image is cropped to 60% of the original full frame. Software Used Images Plus 4.0 for camera control, calibration, stacking, and digital development. Images Plus 4.5 for Advanced Richardson-Lucy deconvolution, multiresolution sharpening, smoothing and noise reduction. Photoshop CS5 used for levels and curves, color correction, selective color, high pass filter, star shrinking, lab color, saturation adjustments, screen mask invert, lens correction, and smart sharpen. Gradient Xterminator for gradient removal. Carboni Tools for additional saturation adjustments, noise reduction, and smoothing. HLVG for additional color correction. Notes As this can be a difficult object to photograph, I am very happy with the final result. This image now represents my longest exposure to date. An earlier processing of this image was chosen Digital Astro Challenge Photo 2nd place for January 2012 in the Galaxy Category.